so today we would like to thank you with a little bit of art knowledge. 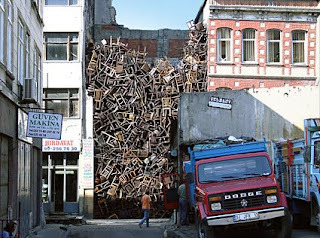 Introducing Doris Salcedo, a Columbian artist, she creates sculptures and installations that re-contextualize everyday domestic items as she alters their physical properties. Using mundane objects and transforming them into something magnificent. The artist is a member of a new generation of young South American artists who are gaining international recognition while remaining in their home countries.